So guess what that meant? 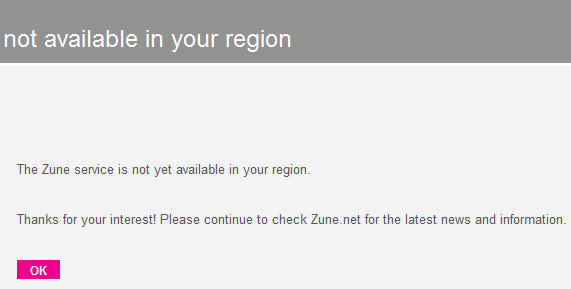 I couldn't log into the Zune software with my proper Canadian Passport profile, couldn't track my plays, etc. Baffled, I reached out to a contact on the Zune team and after he connected me with a support person who gave me some suggestions, I solved it: the problem, I believe, is that I have Firefox 3.0.4 installed, and because I'm Canadian I have the British English version installed - which means that my browser reports en-GB (English-Great Britain) as part of the user agent string. I think the Zune server is detecting that and blocking me, even though there's no good reason to do so. 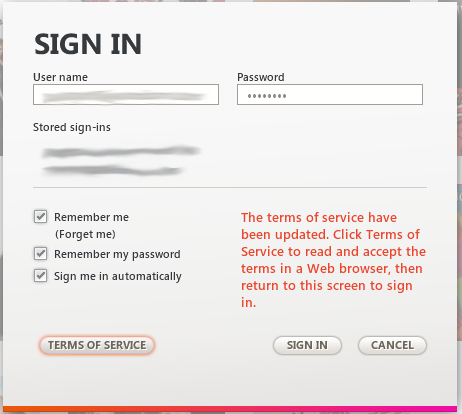 I fixed this by logging into the software on another of my computers, one that didn't have Firefox installed - and when the TOS page opened in IE7, I was able to approve the new TOS and then log into my account. Since there's no way to manually open the TOS URL, you probably want to shut down Firefox, make IE7 the default browser, approve the new TOS, then make Firefox your default browser again. What a hassle! This is another reminder of how much frustration Microsoft causes when they insist on creating artificial barriers to block non US-based Zune owners from enjoying what the Zune has to offer. It's bad enough that after two years, Microsoft still hasn't fully launched this product outside the USA (remember Canada still has no Zune Marketplace) but to artificially restrict non-US users with IP address sniffing and language string detection isn't something that a platform struggling against the iPod can afford to do. Microsoft should be doing everything they can to embrace Zune users, regardless of where they are in the world, and regardless of whether or not the Zune has launched in their country.